a bit about the dance to me, and walked me through the ceremony. They live in a pueblo between Guasave and Los Mochis. 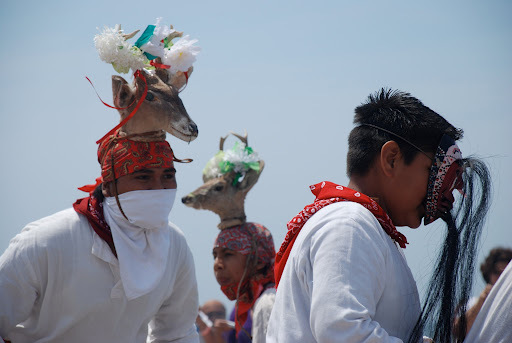 Last year we were privileged to welcome spring with the famous Deer Dance (danza del venado), conducted in the scenic oceanside setting of Las Labradas petroglyph park, a 30 minute drive north of Mazatlán. 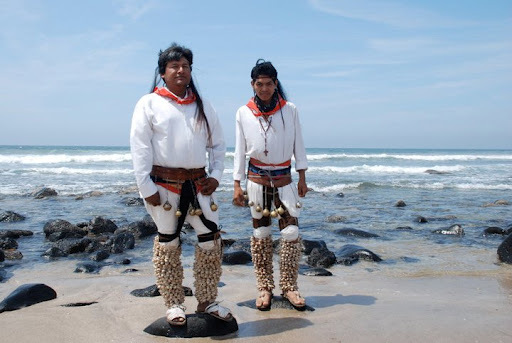 The dance was conducted by the Yeu Matchue, a traditional dance group of Mayo or Yoreme Indians. 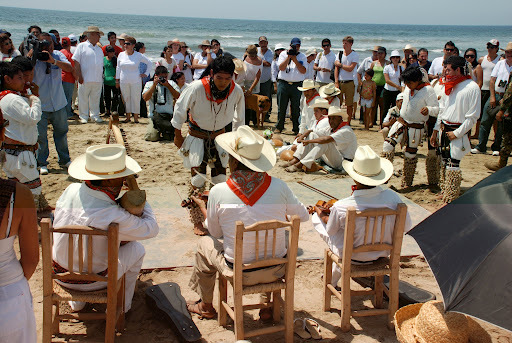 The dance will be conducted again this coming Wednesday, March 21 in the same location, as part of Mazatlán’s International Friendship Week. Be sure not to miss this event! The Mayo are considered to have the purest native blood in Mexico. 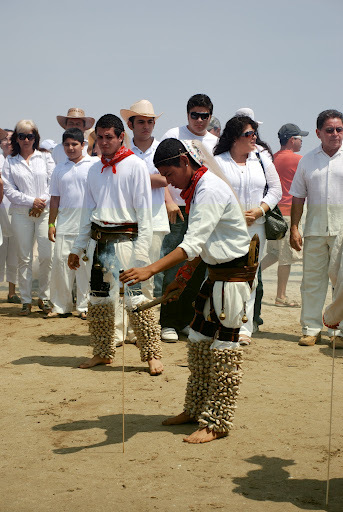 While centuries ago they performed the Danza del Venado in full deerskin clothing with a bow and arrow (it’s the dance of the hunt, and I am Dianne, the goddess of the hunt, ha ha), to welcome the spring solstice at Las Labradas they wore white cotton manta (symbolizing purity), leather belts with deer hooves and bells, they wrapped their shins in leggings made of shells (representing snakes entangled in the deer’s legs), red bandanas (to honor the deer’s sacrifice of its blood), and sonajas or wrist and ankle bands made of nuts and shells. They carry red gourd maracas or shakers. There were at least two dancers who wore taxidermic deer heads decorated with flowers, fastened to their heads with leather straps. They pranced, twitched, paused and sniffed, incredibly evoking the sense that we were watching a deer move through a clearing. It was eerie and beautiful to watch. It was gratifying to see so many young people involved in the ceremony. It is obvious the young Mayo/Yoreme are eager to carry on the traditions of their elders and ancestors. Above is a minute or so of video of the dance. 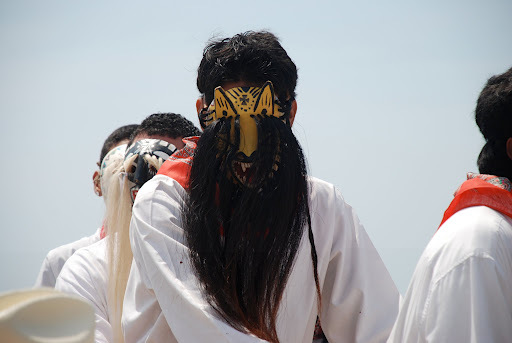 In addition to the boys with the headdresses, there were quite a few others dressed similarly but wearing masks. The masks were made of torote or poplar wood, both very sacred, and painted with smiling faces as well as Christian crosses, with long hair. 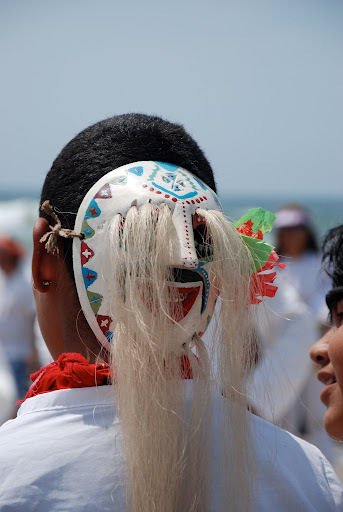 Again, the long hair reminded me of the kachinas. 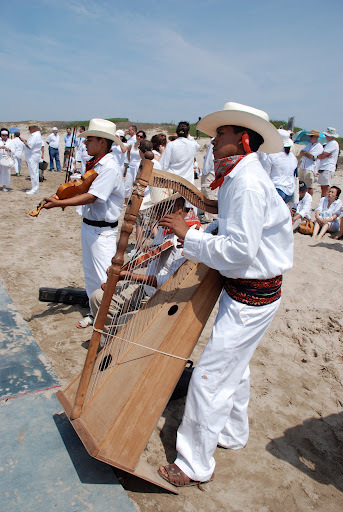 The musicians included a couple of fiddlers who sat in wooden chairs as they played, a large harp (played standing), gourds (sonatas de bule), jiruquias, and various drummers including a water drum. 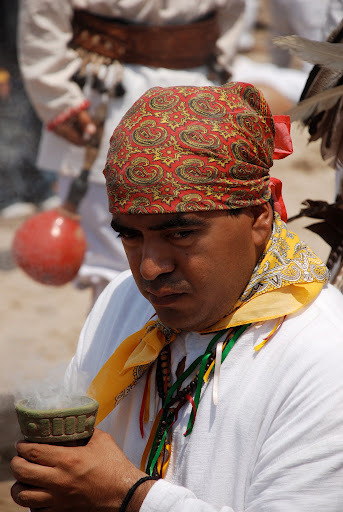 The shaman had an altar or offering of fresh fruit, as well as a container of incense that he used for purification during the ceremony as well as to purify or bless the spectators afterwards. 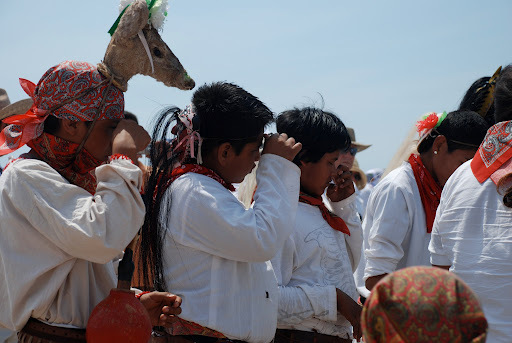 The purification ritual was very similar to what I’ve experienced at Teotihucán on the solstice, or in Mexico City nowadays on the street corners. 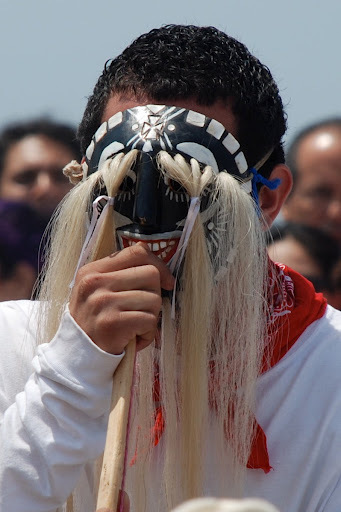 The dance was an interesting mix of indigenous and Christian ceremony, in the Mayo language and rhythms. 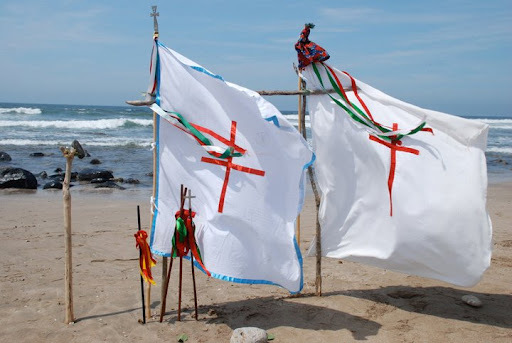 When we arrived we saw several flags or banners with crosses on them on the beach. Beside these were placed the deer headdresses and rattles. During the ceremony, the dancers made the Catholic sign of the cross and held their hands in prayer. 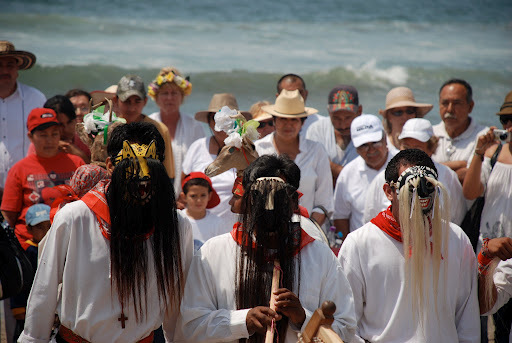 It was evident that the Jesuits of the 16th century had much influence on these indigenous rituals. As with almost any special event I’ve attended in Mexico, the Deer Dance ceremony also included fireworks. An exhibition of the ancient ball game of ulama was also part of last year’s Spring Equinox events. It took place just outside the museum. A game is on the schedule for this year. Las Labradas is a UNESCO World Heritage site. 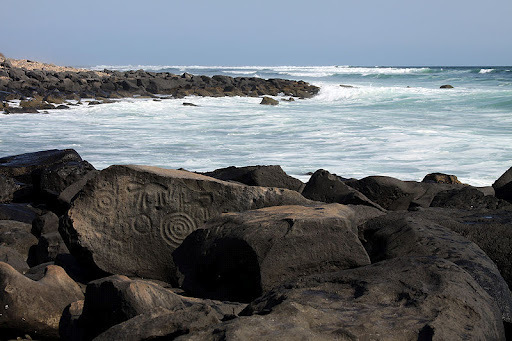 The oceanside petroglyphs, mystical figures carved into the rocks, are dated by INAH at 1000-1500 years old and of Toltec origin. There is a small museum at the site. 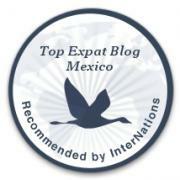 Mazatlán is named after the deer, which in the Náhuatl language is Mazatl (Tlaloc in the Aztec). If you’d like to attend this event next week you can drive north of Mazatlán on Highway 15, exiting at Km. 51 where you’ll see the large petroglyph marker on the west side of the maxipista. It is a dirt road after you leave the highway, through Chicayota to Las Labradas. Alternatively you can take one of the buses that the Sinaloa State Tourism Office has arranged, to depart from la Mujer Mazatleca monument in Olas Altas at 9:00 am. To reserve your spot contact mazatlanturismocultural@gmail.com, or telephone 191-2005. Be sure to wear white clothing. 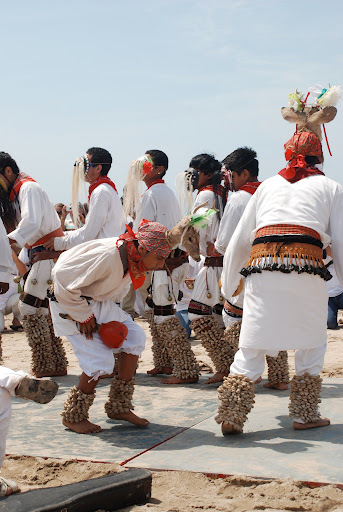 Update May 26, 2012: Today the Noroeste ran an article about these dances, including some of the dancers photographed above. It’s in honor of Festival de la Juventud.